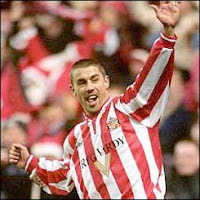 It's been a while since an Englishman has led the English Premier League in scoring, going way back to 99/00 when Sunderland's Kevin Phillips led the league with 30 goals. That total was also good for a European Golden Boot award with Phillips being the only Englishmen to achieve that accomplishment to date. Phillips total is also the last time a player from outside of the Big Four clubs led the league in scoring. In recent seasons, Englishmen have been off the goal scoring pace by quite a wide margin. Will any English player be able to turn that around this season? Bent? Agbonlahor? Ashton? Defoe? Lescott :)? etc..? The numbers list the top scorer followed by the top English scorer for each season.